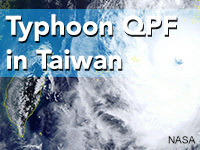 This lesson (available in Chinese) introduces the typhoon QPF forecasting methodology used by the CWB, including the role played by the analogue method and the typhoon rainfall climatology model in Taiwan. The lesson discusses the advantages and limitations of the Ensemble Typhoon QPF model, and includes a case to help learners practice interpreting this guidance and summarizing it to Emergency Operation Centers. The lesson also highlights the need to use probabilistic forecasts instead of deterministic forecasts in order to account for the uncertainties associated with typhoon forecasting. Good module. A correction, however, needs to be made with a passing score of 0%. ● Describe the forecast process and the QPF guidance used to make typhoon QPFs in Taiwan. Explain why the confidence level of each QPF guidance changes along with the forecast hour. ● Explain how the climatology model generates typhoon QPFs and describe its advantages and disadvantages. ● Explain how the Ensemble Typhoon QPF (ETQPF) model creates precipitation forecasts and describe its advantages and disadvantages. ● Explain the advantages of using forecast uncertainty information to estimate and convey the typhoon threat instead of a deterministic-only approach. Use the ETQPF model to estimate the risk of heavy precipitation for locations in Taiwan based on the uncertainty of a typhoon’s track.